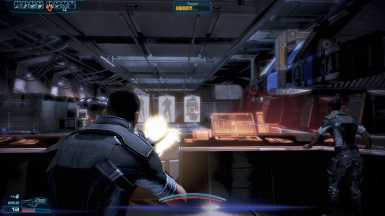 The Expanded Galaxy Mod adds a huge number of changes, both large and small, to improve the overall gameplay of Mass Effect 3, giving the user a more personalized experience. None of the assets contained within this mod maybe used for any purpose without express permission from the author. Special Thanks to: Bluephoenix73, Deadspear, Cheeseycom, Forgetti, Ledbetterman, Valmar and all the players and supporters of EGM. All credits to WarrantyVoider, KFreon, Sir Cxyrtyx, The Fob, Tankmaster, JohnP, Giftfish, Deager, Eric JS, Ottemis, Amarok86, Saltisgood, Femshep and all those who contributed to the toolkit and knowledgebase. Any faults are mine. 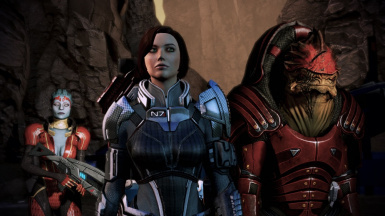 Fixes a bug introduced in 1.14 that stops Wrex loading properly in the Citadel DLC missions. Another (hopefully the last) Mars bug fixed. Thanks to Tsukko for their help. Another bug fixed for loading Mars mission. Fix for David Archer being sometimes loaded on the Normandy even if he wasn't saved. New Medal Case (Achievements) accessible from the Cabin. Galaxy map shows different description of Thessia depending on whether invaded. Custom Extra: Compatibility patch for Tali Remastered v1.01 is now included. Beta war asset system can now be selected in the installer or via Mod Manager's menu. Squad can toggle helmets using H key. 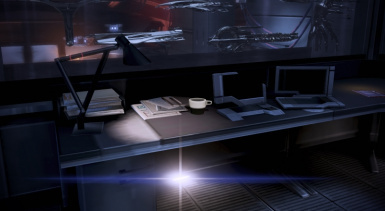 Fixes for a number of problems including deck 3 crashes, Wrex AI, bar chair, barman's face. Fixes bug in the medbay where Eve would disappear. Fix for bug where weapon mods didn't show in the range/table on deck 5. Fix for Omega 4 relay appearing in multiple places once orbited. Portarms (toggle between weapon lowered and raised) press p (or left thumb stick click on controller). Spacebar also fires scan in galaxy map. New Sonax industries war asset when you listen to Liara offer pardon. Improvements to lighting of certain NPC bodyguards. Compatibility with Miranda Mod add-on. Additional Codex entries from ME1/2. Pickup armor during Cerberus Labs mission. Minor bugs and text fixes. Unlocked maps pack : - Adds new armors for Kasumi, Zaeed, Grunt (x2), Samara, Jacob and Jack. Full native compatibility with all versions of Citadel Epilogue Mod (v1.4). 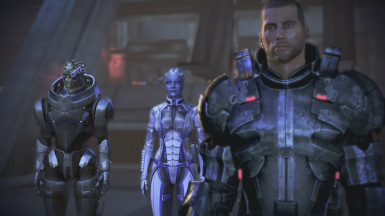 Custom extra available adds a conversation between Liara and Shepard post coup (if the Virmire survivor lives). English only. Fixes bug with Mordin becoming invisible in the medbay. Fixes bugs with Mako pickup and Mechdog purchase. Camala being highlighted after the mission has ended. Bug fixes, mainly to equipment manifest. Improve MP resource handling to work better with SP controller mod. Fix for a minor bug in the installer (mod content unchanged). Fixed bug with broshep armor model hands. Fixed bug that prevented maximum bonuses during the Evacuation of Thessia. Fixed bug that stopped Javik's translator GAW from firing. Fixed issue that prevented bonuses showing in Armor locker. Fixed bug that sometimes prevented Geth Primes visiting post Legion - Geth Consensus. Bug fix that prevented Shadow Broker wet team from appearing in the Cargo deck post rescue. Fix Assignment: Criminals versus Veterans. Now will not fire if Omega DLC is started before 2 missions after meeting Aria on the Citadel. Fix issue with Asari councillor plus minor map bug fixes. - N7 Helmets & separate bodies, Fury Mask/Hood/Sentry option. - N7 Mission timings can be set. - Prothean Cybernetic Implants - bonuses to include 2x shot capacity. - Small improvements to certain textures. Crew: Medics, Marines, Engineers, Chef/Barman & Personnel GUI. Visitors: Samara, Grunt + Aralakh, Primes, Shadow Broker Wet Team, Geth Fighter. Map: Ilos, Voyager Cluster, new Relay video, Virmire memorial cinematic, Tartarus improvements. Arms: Add N7 Armors, other armors, armor seperation, Revision to fix completely Collector Weapons. Text edits: lots & lots of revisions. Mod Settings / Timings module. Upgrades MapOnly version to the latest copy of the map, including new systems Tartarus and Sentry Omega. Overwrites previous version automatically. Lots of minor fixes, text and artwork improvements. Prothean Sphere added to the Cabin, available during a mission, along with details about what happened to one of your former crew. (also available at a certain extranet store if missed during mission, dependent on recovery in ME2). Thanemod v2 Compatibility Patch added. Enables full version of mapmod to work with Thanemod v2 without any GAW/Email text errors. Installs to its own DLC directory. 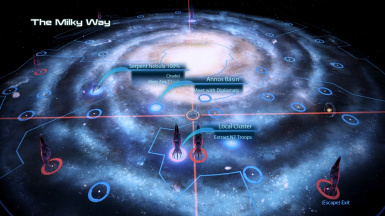 The Expanded Galaxy Mod is designed to improve and expand on Mass Effect 3, to give players the ability to create a more custom experience and improve the immersive atmosphere of being small but vital part of a huge war. 4 new guns, 21 new sets of armor including the N7 kits from Multiplayer. Install cybernetics with powerful bonuses that give new tactical possibilities in firefights. Pick your senior crew members, recruit additional medics, engineers, marines and others, all with unique bonuses from a brand new GUI command console. Upgrade the Normandy's engines, scanners and other improvements, all having real-time impact on gameplay. a SHOOTING RANGE on the cargo deck. An open map covering the entire galaxy from the series. Decide where to go, what to discover. Experience new video and audio content whilst travelling. See the war unfold across the map and find new assets on the war front. Make paragon or renegade choices, decide whether to risk your forces for possible gains in the war and find unique traders with special stores. Major decisions about who to side with have bigger long term consequences. Revised War Assets System which sees your troops gain and lose power as the war unfolds. Notifications and AIS reports about battles, losses and gains. Ark Mod - A brand new N7 mission, hazard maps, new enemies plus more. Omega Hub - A new hub on Omega. Visit Afterlife, hang with your crew and see how Omega is faring. Requires Omega DLC. Alliance Warpack - 8 New additional armors for squadmates Ashley, Kaidan, EDI and James. Created by Realsurvivor and Patadepocho. Requires the latest version of EGM. EGM Squadmate pack - 8 additional missions unlocked to use the new squadmates. Additional armors for Grunt (x2), Samara, Kasumi, Zaeed, Jacob and Tali. Armors created by Mellin. Requires Citadel DLC. 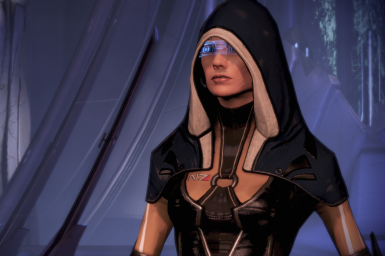 Miranda Mod - Bring Miranda on board the Normandy as a crew member. Includes 2 new conversations and a voiced romance scene. Created by the EGM team and Deager, AVPen and Giftfish. HR vehicle pack - 4k textures for for many of the vehicles you can find and show off in the Normandy's cargo bay. Created by Mellin. Alliance Armor Pack - 4 new armors for Shepard with Alliance colors. Textures by Ottemis/Chashin. Requires Citadel DLC. Urz on the Normandy - Replace the Robodog with Urz. For EGM this adds a module to the manifest that allows you to swap between Urz and the Robodog. Created by Moho25/Giftfish. Pretty much everything in EGM is designed to be optional. If you just want armors and guns you can ignore the rest. However repeated feedback has been how players love the immersive RPG qualities even when they started not 100% sure. Originally the final version of EGM was supposed to ship with a revised war assets system. We ran out of time to test it so it was removed. It is now restored and the player can choose the Beta of the new war asset system or the old version as they prefer during installation. The impact of MP Galactic Readiness has been completely removed. The player is always at 100% readiness. The war assets console shows the target to get the best outcome (not a random level). To compensate for readiness increasing the targets have been doubled. (i.e. the best outcome requires 6,200 vs 3,100 originally). The player can stick with the default level or increase the difficulty level via the EGM settings file anytime before Priority: Surkesh. After that point the difficulty setting is locked in. The difficulty targets vary depending on whether the player is using an ME2 import (so has potentially greater war assets). 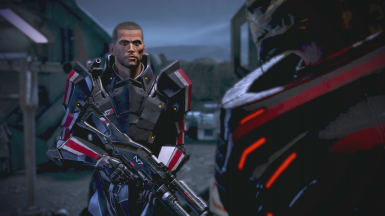 The hardest level of difficulty will make Shepard's choices more important. A full paragon will have to make sacrifices. Note this system has not been balanced via playtesting. We welcome feedback on it. You must have installed the free extended cut dlc for the beta system to work. The baseline readiness is 50% + Multiplayer bonuses. The target is 3,100 for the best outcome. The target in the war assets console is a medium outcome. Mod manager users must set the install to use the old system. Menu => Mod Utils, 7 alternate install options => make sure Original War Asset system is checked. NOTE: SP Controller Mod users MUST update Mod Manager to v5.0.8 or later and MUST build a fresh new GUI patch. Gladius M-57 - The latest product of Spectre R&D the Gladius is a fully automatic rifle with a powerful shot but a very strong kick. It can be found in the game, STR R&D produces a human usable variant to celebrate a new human spectre. Collector Weapons - salvaged from a location in the map or as a reward for an assignment. They have been thoroughly tested and revised to remove texture glitches caused by using MP assets in SP. Geth Spitfire - can only be gained from the Dealer, a weapons collector and battlefield salvager who can be encountered in the map. He will request some tasks in order to unlock items. ME2 Weapon Imports your former crewmates put aside your weapons in ME2, get them delivered to the Normandy and have all your old favourites upgraded to how you had them. New Armors & new options - Femshep has 15 new options, Broshep has 13. Your can now use the full body kits as separate helmets and bodies. N7 Armors - All 6 are available : the T5-V Devastator Battlesuit, Slayer, Paladin, Fury, Demolisher and Shadow kits. (a) On either the full body or torso versions set the game options "Narratives" and "Helmets Off in Conversations" as "default"
(b) On the torso version use the Fury Mask, Fury Sentry or Fury Hood. You can tint the armors with the torso versions, the tinting doesn't always translate directly from MP to SP - sometimes you need to change the pattern for the tinting to work. The bonuses are all hard coded into the game so work properly. The N7 armors can be purchased from Alliance Requisitions (either on Normandy or cheaper by going to the depot). Broshep: Soldiers get T5-V, Vanguards, Adepts and Infiltrators get the Slayer kit, Sentinels and Engineers get the Paladin set. Femshep: Soldiers get T5-V, Vanguards and Adepts get the Fury kit, Sentinels and Engineers get the Demolisher set, whilst Infiltrators get the Shadow kit. The armors are held in seperate files so all the existing armors can also be worn. The Garmr Armor can be purchased from Spectre Reqs or FREE on retaking the Normandy in the Citadel DLC. 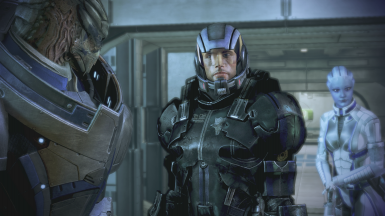 Broshep automatically gets the Marine Armor, Femshep the Phoenix suit on arriving on the Normandy. In additional the Citadel DLC suit is available as casual clothing from the start of the game (if you have the DLC). Cortez will email you about the deliver on first trip to the Citadel. Only works with direct import - not a new game +. However with the import you can upgrade weapons to level X. If you find a weapon in ME3 it will drop out of the box (save for prologue weapons that will dissappear if you upgrade them). The box will get cleared away 7-8 missions into the game. 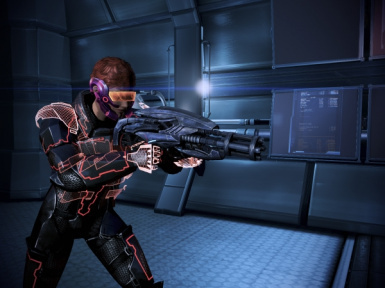 Port Arms & Toggle Helmets - Shepard can switch between two different stances - weapon raised or lowered during combat missions. Press P on a keyboard. On a controller (click left stick). 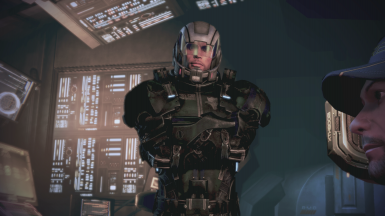 To toggle the squads helmets during a mission press H.
Prothean Cybernetic Implants - You can find a very powerful Prothean cybernetic technology that can be implanted in Shepard in the medbay. This will become available during an assignment that appears around the time of Priority: Surkesh. These drain the excess energy/heat from your weapon and store it. This means all your weapons have doubled shot capacity until they need to change clips (or vent). For example a Widow has 2 shots. However the downside or having batteries in your arms is reduced health. 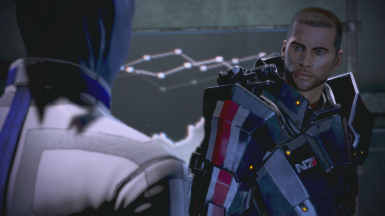 Some of the health loss can be mitigated if you utilise schematics to focus the energy back into Shepard's biotics or suit systems - giving very powerful bonuses. 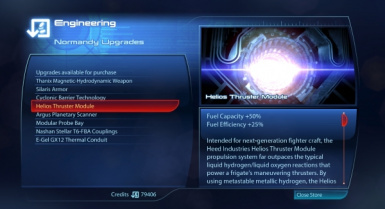 Essentially the Prothean tech allows the player to experiment with different combat styles (for example a player who wants to be an ultimate sniper gets a big upgrade to headshots, but if they miss the head their regular damage is reduced; or a player who fancies trying a very nimble fast style of fighting upgrades speed but also gets reduced shielding forcing them to duck and cover to avoid incoming fire rather than tanking). Playing with a different and completely unbalanced style can be fun, but not necessarily easier. The implantation is done in the medbay, and the implants can be removed or changed at any time. Implants - available at the first beacon you find. - All users - Weapon Heat Dispersion - +100% shot capacity prior to reload. - All users - Health -30% or -20% if one of the schematics is applied. Schematics - available as you discover new Prothean sites. The final schematic is given during the Evacuation of Thessia. Selecting a new avatar when you receive the second tech will overwrite the first. Customise the Crew Choose your XO and Marine Lieutenant* from your personnel database, with bios that reflect how your squad and crew developed throughout the series. Add Medics, Engineers and other people, more options become available as the game progresses. Each crew has different bonuses that reflect their skills and background. 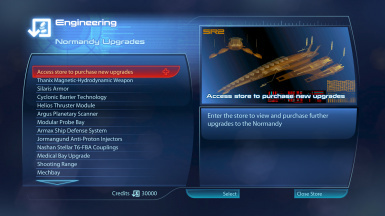 Upgrade the Ship A console in engineering allows upgrades to be purchased (and it imports ME2 upgrades). Improve scanners, engines, ship defences or weapons. Add a firing range. All have real gameplay consequences either in the galaxy map, war assets or bonuses. Customize your equipment Purchase or find new equipment and then the use a new command GUI to select your favourites. Replace the shuttle Vega crashes on Mars with 8 different vehicles, some can to be requisitioned, others can be found in the map. Change the targets and setup of the firing range. Add Javelin missiles. All equipment can be stored at the Citadel and used whenever you want. New cabin items and romantic invites Items hidden in the ship or in the game, with many dependant on ME1/2. Love interests can be invited up to the cabin as well. A huge number of improvements and restorationsNormandy Radio, CIC war console, Shadow Broker screens change depending on what Liara is watching, Spectre terminal on the Normandy, shutters in cockpit and bar, special hidden store, terminal in life support, Bolto the dog interactions and dozens of other graphics and textures fixes. 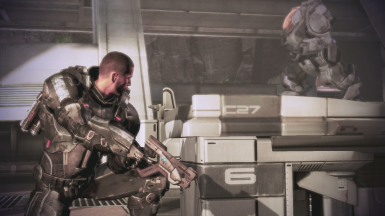 * = XO and Lieutenant are the respective rank equivalent to Pressly and Kaidan in ME1, or Miranda and Jacob in ME2. You will need to appoint an XO and/or Lieutenant before you can adjust some crew settings. Any of your squadmates who are on the Normandy can be appointed XO, along with Joker, EDI or Steve. 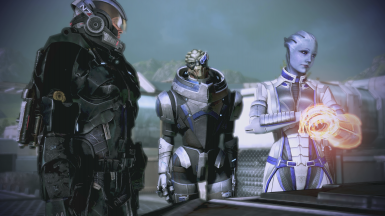 Only those with military training (VS, Javik, Garrus and James) can be LT.
Tali can also be made Chief Engineer ahead of Adams. You can change crew or appointments at any time if you wish, the bonuses will only reflect the current crew. You can change vehicles etc anytime - once you purchase something it is stored on the Citadel if not in use. A user requested the Normandy humm be replaced by the ship music from ME1, this is available as an optional add-on pack. The firing range can be purchased from the upgrades terminal, but is setup in cargo deck. Open Galaxy Map allows you to control where to go, and visualise the war are the Reapers gain systems. 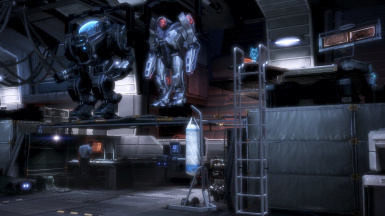 New War Assets are unlocked mainly in systems where the Reapers have invaded (along the Reaper battle front line). ME1/2 mission locations sometimes have Assets that tie back into the location and mission choices.Regular AIS reports show hints. MOST SEARCH & RESCUE ASSETS IN THE MAP DO NOT UNLOCK UNTIL THE REAPERS INVADE. IF YOU SEE A CLUSTER NOT AT 100% WITH A REAPER ON IT, IT IS PROBABLY WORTH CHECKING. The entire galaxy map from the series is available to explore. Specialist Traynor makes occasional comments when entering certain systems or clusters with GAW. Shorter and less noisy Relay video (customisable). Map based supply depots with unique equipment. * = depends on choices in ME1/2/3. 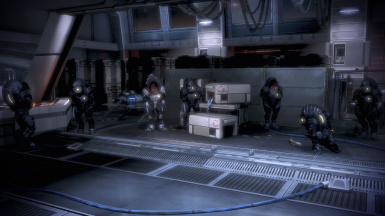 New Squadmates - Bring Kasumi, Wrex, Miranda, Grunt, Zaeed, Jack, Samara, Jacob, or Aria T'Loak on selected missions. Set up to 2 to be on standby ready to join you on missions using the manifest. Requires Citadel DLC. New Assignments - Interactive assignments designed to improve on the standard fetch quests from the vanilla game, usually expanding on existing lore. These involve a variety of decisions - some about whether to risk forces for gain, others paragon v renegade choices. Rewards include credits, War Assets, Reputation and Paragon or Renegade points. The Dealer - A unique weapons dealer and salvage merchant can be found in the map (with a little help from an information broker). In return for artifacts and technology that can be found across the galaxy he will offer choices from his collection of high end weapons and armor, usually for free (or at a huge discount). 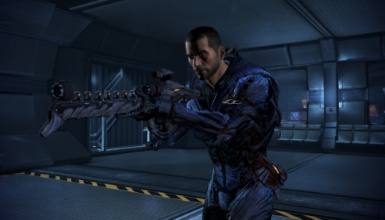 This includes some of the most expensive weapons in the game, and the Geth Spitfire. All assignments are given by email and properly journaled so you won't miss them. They unlock as the game progresses, some are time limited - but if so this is clearly stated. Some are dependant on mission completions/choices and DLC setup. Normandy as part of the war The Normandy is a warship fighting in a pan-galactic war. The mod puts the Normandy back in context as a small but important component of this broader conflict. Alliance Intelligence (AIS) give you regular updates and notifications pop-up when major battles occur. Revised War Assets System The war assets system has had major revisions. No longer is the Normandy worth more than an entire Alliance fleet, or single individuals worth as much as entire forces. The impact of promotions in MP which made war assets meaningless has been replaced by individual assets that represent each MP class.Major decisions like Krogan v Salarians or Geth v Quarians carry far greater importance. Lots more assets tie back into your decisions in ME1/2 and 3. Moreover the war impacts assets - as battles occur losses happen. Visitors and old friends As you encounter old friends and undertake missions (especially rescues) these people will stick around, at least until you orbit the Citadel so you can drop them off. Another example - pilot a fighter out of a Geth Dreadnought, well you can find it in the cargo deck when you complete your debrief. Your XO will usually advise you if there are visitors. Currently these visits are not interactive. Ever get frustrated that Aria is asking you to jaunt off to Omega when you have only just got on the Normandy, and you want to leave it until closer to the end? Or that Mordin says "everything is ready, lets go cure the genophage" even though you have a bunch of missions that need to be done before Tuchanka? If so then these optional settings can be modified to suit your preferences. Best done before a new playthrough (once a mission/mail is unlocked it stays unlocked). Default is the normal ME3 timings. Which relay video to use (or none at all). Select how new squadmates become available. Unlock the Cerberus Ajax armor as seperate helmet/torso (if you have the AAP dlc). Set the timings for when the emails that start the From Ashes, Leviathan, Omega and Citadel DLCs arrive. Set whether Mordin briefs you about the Genophage cure being ready immediately or in a seperate cutscene. 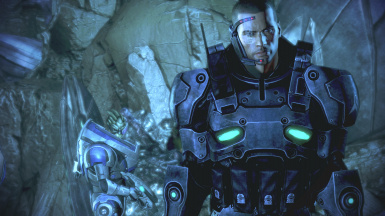 Set whether Hackett briefs you about the Quarians immediately or in a seperate cutscene. 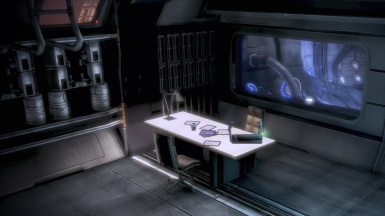 Set whether the Asari Councillor briefs you about the situation on Thessia immediately post Rannoch or in a seperate cutscene. Change the timing of each N7 mission. 100% DLC mod. Works perfectly with EA Origin. Unpacked size is 1.4GB. There are 2 installers - a 7z which is installed via Mod Manager and an Exe. Which you use is entirely up to your preference, the mod content is identical. Those players using SP controller mod should use the Mod Manager install for compatibility reasons. 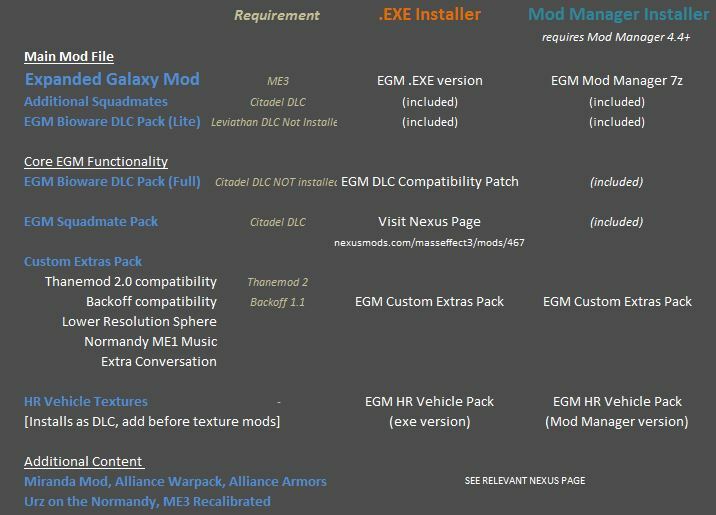 The Mod Manager installer contains the full compatibility pack and additional unlocked maps for squadmates by default. Mod Manager can also advise you when an update is released and download it for you automatically. For more information on Mod Manager go to its nexus page. Important Note re New Game Plus: if you import an ME3 save to start a playthrough as a New Game Plus only a tiny fraction of the players history from ME1/2 gets re-imported. This is done by the vanilla game and it only keeps what it considers important (major decisions, love interests etc). This means many of the war assets and assignments EGM introduces relating to ME1/2 will not appear. EGM rebalances an ME2 import to feel more like a new game plus (weapons go to level X, ME2 weapons get imported etc). Pick which installation version you prefer, .Exe v Mod Manager. There are various add-ons and extras you can customise if you want, and have the required DLC. No vanilla files are changed, to remove the mod just delete the DLC_MOD_EGM directories. If you do not have the CITADEL dlc you will need to install the compatibility pack. IMPORTANT: If you plan to add Textures via Texplorer you MUST use ME3Explorer v3.0 or later or use ALOT's MEM tool. Other Mods: Backoff, Thanemod & TaliRemastered require small add on packs. MEHEM compatibility is built into EGM. Citadel Epilogue Mod (CEM), LIME, JAM and all the other ending mods work well. 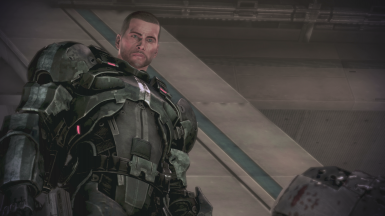 ME3Recalibrated, Tali Romance Mod (EGM version) and the Bonus Power Packs are all compatible. The Single Player Controller Mod you need to build a patch using ModManager once you have completed the installation of all your mods. Most other mods should be compatible, if you have a favourite that isn't let us know. Texture Mods: EGM works well with Texture Mods, such as ALOT. No vanilla files were harmed in the process of making the mod, so the vast majority of your existing texture mods will still show. The Prothean Sphere realtime reflections use a lot of CPU power. If you experience lagging in the cabin, download the patch that switches this off. If you have an error make sure you follow the troubleshooter and read the FAQs.Questions from people who have not read the FAQs will be ignored or deleted. Special Thanks to: Bluephoenix73, Deadspear, Cheeseycom, Forgetti, Ledbetterman, Sil, Valmar, Viper and all the players, testers and supporters of EGM.